Well, as nobody seems to visit the "layouts in the planning stage" section I've now moved Birkdale Northgate to this forum as I started building it on Saturday! Made good progress for day one of a first attempt! I can't get that roofing felt over here have to settle with gray painted base board, may lightly sprinkle some ballast. Have to say it all looks very impressive to me, so we'll done. As someone who also runs under trees you may want to look at some sort of track bed covering during the autum/winter. Leaves are not a problem to brush off when dry but can be a real pain to shift once there wet! Further progress last night, but also the first "incident"! Its my own fault, I felt the need to test my pointwork and my Heljan class 27 derailed and fell off the layout on to the grass! Luckily it is rained softened so no real damage, but has anyone with an elevated section developed a "safety net" mechanism (literally) to catch falling stock? Looking good so far. I like the pointwork, interesting to look at and use. I agree with your choice of express points. All my standard points are now express and much more reliable. 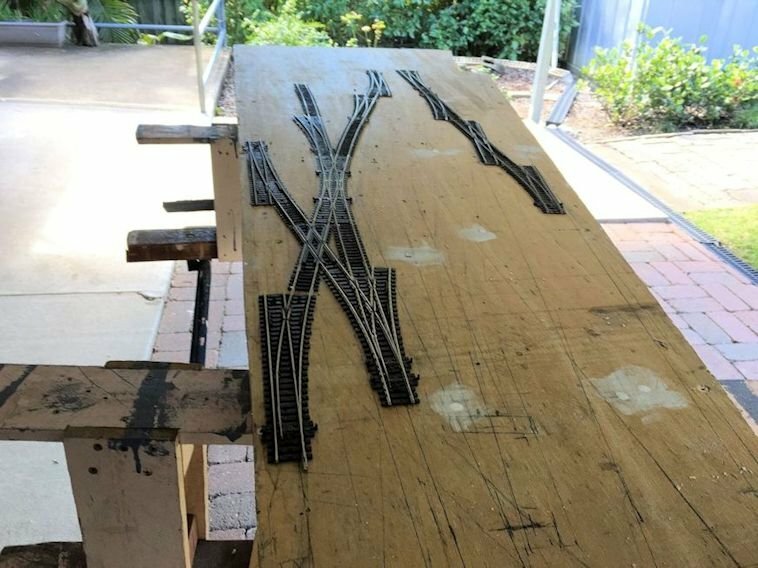 You are now a garden railway enthusiast because you have a layout under way. I agree, those long points look great and will likely work well too. Looking good like your point work with the two cross overs, you just have to slow the train down going through the points, they do that with the 1.1 trains unless the points are real long, Thomas is building his own points they are awesome, he is modelling high speed trains. I am going to the hobby shop on Monday in Ipswich to two buy two Peco express points,, agree with Griff , I be a while yet before I get something running after the set back in June. I have points and cross overs like yours on my layout as well, back into the my layout tomorrow finishing off the hinge legs ready to paint module. Well, if its points you like, check these out............! Arrived today. WOW, that set would of cost you a pretty penny, here is a pic from my point plan what I have planned, 5 tracks merging into two track, what I always wanted to do, is the points and cross overs Peco, can't wait to see more of your layout , keep the pics coming. Tony from down under keeping on moving ahead..
That is some crazy point work. I thought I was getting sort of wild when I contemplated adding some double slip switches into my layout. They're actually very rare here in the USA. A few photos of the connecting piece between the 2 plank wide running lines and the 5 plank wide station board, the station throat pointwork, and a first attempt at the station layout (should I add a 5th platfform?!). Oh, and a bargain new addition to the layout, a dirty class 40 for £65! Nice indeed, what is the brand of those points and cross overs you bought having trouble findidng them, they sure save space and very interested in how you are going to tackle in wiring them up are they insulfrog, all mine are insolfrog, just as well because I would of had a lot of trouble in wiring my configuration of points and cross overs. 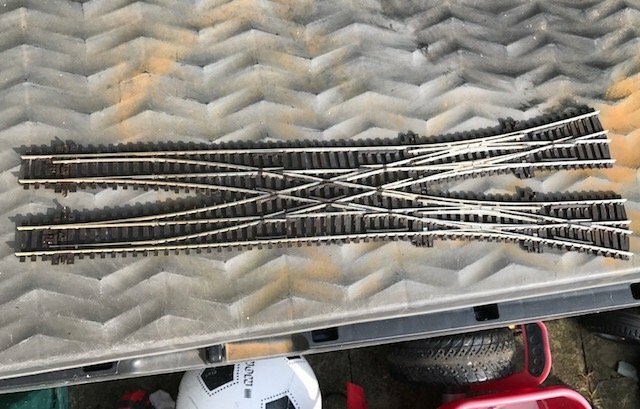 I decided to make up two smaller blocks to keep the points and cross overs away from the main line and enough length to do shunting as well, I have 7 platfrom track feeding onto the main line,as it is is a nightmare wiring those two blocks be interesting how you wire yours up, a friend gave me a track buss bar he made up for finiding out shorts does work, you can buy them RTR. THat is not bad at all 65 pound for that class 40 loco a rare loco indeed, I have quite a few Bachmann DD40AX locos and Athearn DD40 locos, one I modifyed a DD35/B class loco no cab and two I have planned to modify into track clearners based on your Network track cleaners,Bachmann bring one out. It is slow going doing the bus wiring stripping the wire for the feeder wires and soldering them onto the bus wire, I now use that heat shrink instead of tape neater and last longer . Looking forward to seein more pics of your progress. Yeah, all insulfrog. The station throat is a bespoke unit made by a guy who uses Peco points and joins them all together to make something new. You'll find them on eBay. Im going to be running using DCC so am avoiding blocks for now. You? Finally I'm using those crimped connectors to join the drop wires to the bus; I HATE soldering! No I wont be going DCC at this stage stuck with DC, will wait after I get the layout up and running aiming for the end of this year being a long build on my own liike a lot of us modellers,I am looking at NCE ,Lenz is a lot cheaper depends on my budget and twisting my wifes arm a little, need to buy a couple more Peco points this week.left hand. The Americans use those connectors as well, how are you going to attach the feeder wires to the track, there is a solder glue you can buy, I don't mind doing th esoldering got it down to a fine art now and bought a pair of wire strippers that are pure awesome can strip wires mis stream, Irwin brain Bunnning sell them. I spent all day worin gmy the bur wiring slow going with the soldering of the feeder wires, only two blocks to go and running out of wire, I use a thicker wire for the main line red and green and the wires close to the main control panel a thinner wirered and black easy to trace if there is a problem, you can have a look on my post what plugs I use, doing the bus wiring for both DCC and DC just a matter of unpluging the main panel and two wires in for the DCC linking up all the other blocks.to easy. Two blocks to solder now on that module then solder the feeder wires to the track won ttake long, keeping the soldering iron top cool. Love the pointwork. I to bought a similar junction of probably the same guy on e bay a while a go. For me it saved me about a foot of space in the station throat if l used conventinal points and slips. A word of warning though, you may wish to cover it up when not in use, l found that when l was realigning some track the sleepers had become brittle and the track seperated from the chairs! Not a major problem, it all poped back in place. but UV can effect Peco track given time. I belive some people varnish the sleepers when using them out side to protect them from this. My neighbour came round last night and asked if some gutter replacement people could have access down the side of our house to replace his gutters. He saw that my garden railway boards were being built down the side of my house and that all my tools were there but didn't say anything about them needing to be moved. As requested I left the side gates open this morning so they could have access, and I was home for lunch when they first went down the side. As I left to go back to work I was faced with the sight of the entire area having been cleared by them, including my work in progress station boards, with everything being dumped in front of my garage. I think my exact words were "WHAT THE FU@&........". I told them they had no right whatsoever to come on to my property and move stuff around like that, especially delicate items that couldn't yet be moved (I'd have told my neighbour "no" if he'd said they needed to be moved, I'm finishing them tomorrow and stuff isn't properly secured and wired yet). They looked at me like they couldn't see what the problem was (they kept referring to the "train set" like it was no big deal). Hi auro140012, Contractors don't give a stuff we have had bad exsperences as well, I have learnt to shift stuff out the way, was there any damage done if so you can send the neighbout the bill or to the contractors, depending on what your lwas over here cover you, we have funny laws over here now especially when it comes to trees. A lot of people regard the hobby to toy trains where they are not toys at all, I have carers come here to shower my dissabled son they take no notice and if they do ask about the layout and I start taking about the trains in one ear and out the other.same with family,had an uncle that was interested in the trains had a layout we could talk for hours, sadly he passed away last friday, before he went into hospital he said I could have all his trains. I can't have a permanent oudoor layout why I am building mine to a module design taking a lot longer to build,summers over here are very hot and the base boards won't last long especially outside, woth the effort in the end. I have been on at the council about two trees that overhang my property, shading a large part of the garden and depositing large amount leaves on the railway!. Shading is not there problem they tell me and its down to me to pay for it. Silly quotes from tree men so have learnt to live with it. Then recently l noticed one was leaning over much more than it had been and discovered it had become uprooted and was only staying upright because it was supported by the councils metal fence. Anyway, after a lot of phone calls the councils contractors finally turn up and start to cut it down. Que knock on door "sorry guv , a branch has fallen in your garden, can we get it, oh and we might have damaged your fence". So out to the garden to find large 8 ft branch lying across my fence, they then pull it off said fence on too the railway that runs along side it pulling the return loop that there with it !. OK it was never the most stable of structres but l was not best pleased to put it mildly. So off they trot leaving a collaped railway, damaged fence, and trampeld bush in there wake and a telephone number if l want to make a claim. So lady from council comes round with clip board and camera. Looks at fence damage, they pulled the top off it, mutters that it was rotten anyway, and moves to railway. More pictures taken and of she trots as well. Ten days latter letter from council they will pay £20 for fence damage and trappled bush, but nothing for "train set"as l "could have removed it to prevent damage". Now its not the money, all is repairable, its just a couple of bits of wood and the bush was a pain anyway its just the "so what" attitude of some people making light of something l do for pleasure, garden and railway, just because they have no life. Anyway, had a moan at local councillor, who was stupid enough to leave his e mail address once, and he's looking in to it. The wood is there to give me somthing to do over the bank holiday!! That diesel looks great. Well, you know. It looks like crap in a good way. Ridden hard and put away wet one too many times.